Are you a wine lover who has an unused space in your home? Why don’t you convert it into a storage space for your wines? Nowadays, wine cellar conversions are in demand in many parts of the world. Checkout the residential wine cellar and tasting room designed and installed by Wine Cellar Specialists in Texas. You can build your dream wine cellar in a garage, closet, or in a space under the staircase. You must hire an experienced designer and installer of Texas wine rooms to ensure that every component suits all of your functional, aesthetic, and financial requirements. Wine Cellar Specialists, one of our trusted wine room builders, has recently completed an installation project in Flower Mound, Texas. The client had a room that was meant to be used as an office space. They seldom use it, so they decided to convert it to into a storage room for wine. It had green walls, built in cabinets, and large windows. In this project, Wine Cellar Specialists incorporated custom features to give character to the cellar. To add functionality to the storage facility, they built an adjoining wine tasting room. Let us learn more about the wine racks, cooling unit, and other features that make this wine room a unique and safe place for aging wine and entertaining friends. 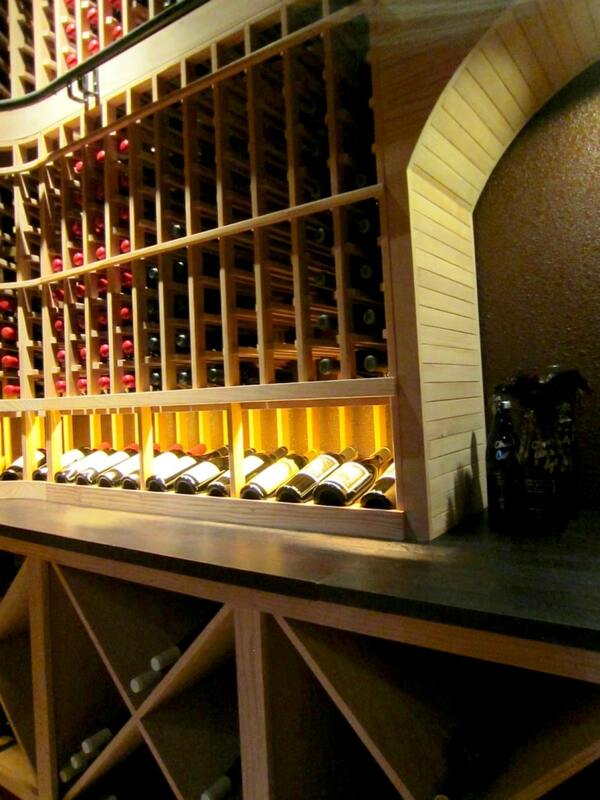 Your wine storage space must be designed creatively to add beauty to your home. The style and construction material of your wine racks are factors that affect the visual appeal of your home wine cellar. Your racking system must be made from a durable, strong, and flexible material. 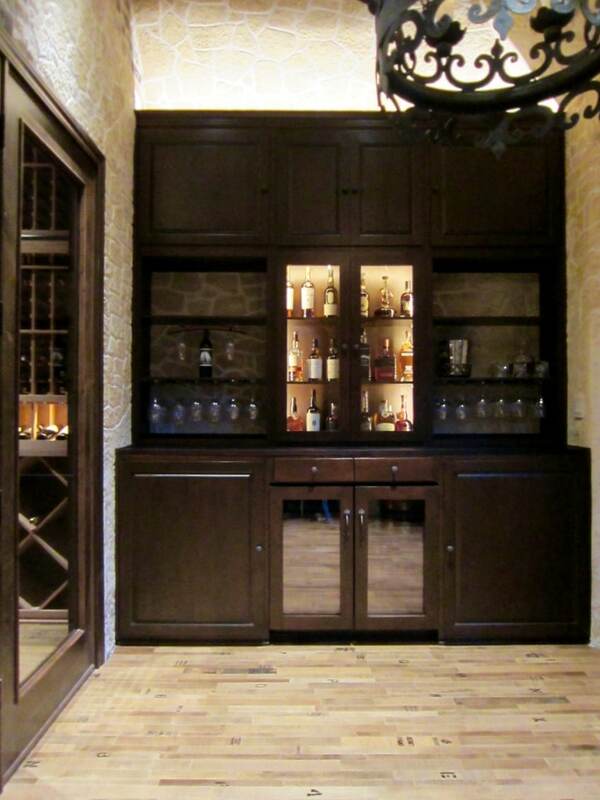 In this Texas custom wine cellar, Wine Cellar Specialists combined various racking styles. The left and right sidewalls consist of solid diamond bins at the bottom section and single bottle storage racks at the top. There is a high reveal display row at the middle of the racking. This racking style highlights some of the owner’s bottles at a 15-degree angle, allowing the cork to be in contact with the wine. It is important to keep the cork moist to prevent it from shrinking and becoming brittle. The cork should be able to maintain its elasticity to prevent an unwanted amount of oxygen to mix with the wine. Oxidation occurs when the cork dries out. Oxidized wine has an unpleasant taste and smell. The back wall was designed with a solid arch at the center. To add more character and flair to the room, Wine Cellar Specialists installed a puck light above the arch. Magnum size bottles can be stored in horizontal wine racks that are located above the solid arch. There are individual storage slots and high reveal display rows on both sides of the arch. A tabletop lines the middle section of the back wall. It is made from the wine infused side reclaimed wine barrels. Since the planks were stained by the wine that was once stored in the barrel, the tabletop shows a reddish color. The tabletop adds more space for storing a few bottles and for decanting and serving wine. The bottom section consists of double deep X bins and six rolling case storage slots. The rolling cases allow for easy access to the cases placed at the back of the area. Known for its many benefits, wood is a favorite wine rack material of residential owners. It is naturally beautiful and can complement the existing theme of a home. Wine Cellar Specialists used All Heart Redwood for this lovely Texas custom wine cellar. In addition to its aesthetic appeal, this wood is popular for its durability and flexibility. Its natural wood preservatives make it highly resistant to decay, molds, and shrinkage. View another custom wine room installed with Redwood wine racks. If you have a large wine storage space, adding a wine tasting room and bar area is recommended. This feature provides a nice entertainment area and wine tasting party venue. A home bar area was installed in the right wall of the room. It is made from Knotty Alder, one of the most sought-after wood varieties when building furniture. The topmost section of the home bar consists of four solid cabinets. The middle section has a lighted cabinet with a front door made of glass. On each side of this cabinet is a 3-level open shelf. The bottom sections are intended for the glassware. A 3036 model built-in refrigerator by Uline was installed at the center bottom of the home bar, with cabinets on each side. The cabinets have adjustable shelves inside. Wine Cellar Specialists added two drawers above the built in refrigerator, and an Infusion style tabletop made from reclaimed wine barrels. 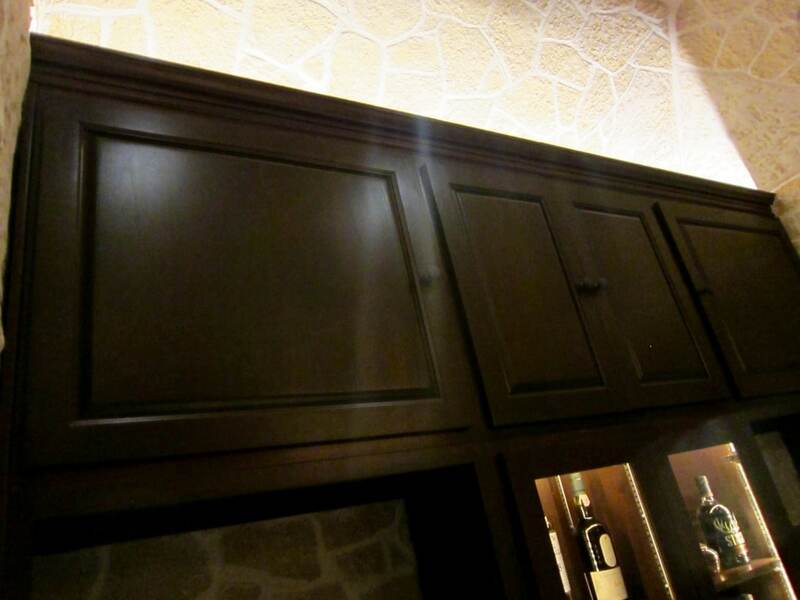 They supplied all the handles and knobs for the home bar and the wine cellar. The walls and ceiling were designed with a Stonecoat material. Stonecoat is made from crushed limestone. It is blown into the surface, hand carved, and colored to create a gorgeous stone effect. At the center of the ceiling is a Nico style chandelier, which is 30” in diameter. 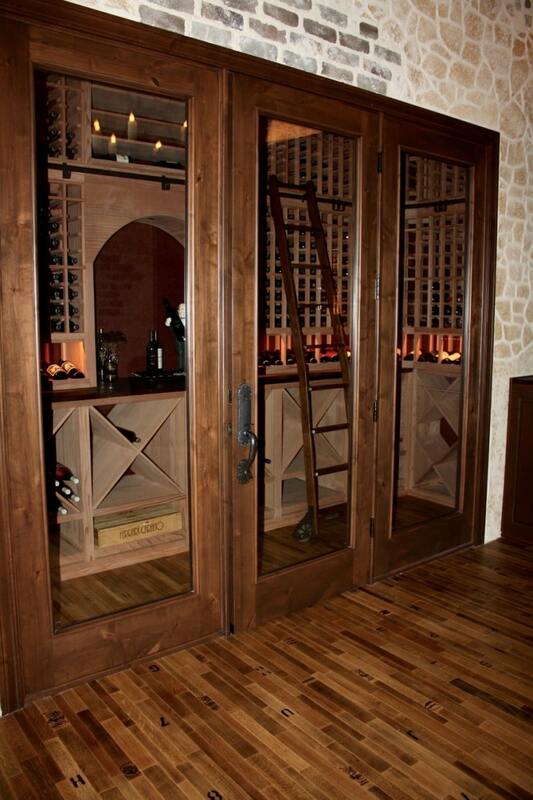 Wine Cellar Specialists offers various styles of doors for wine rooms. In choosing an entryway, they make sure that it suits the aesthetic desires of the owner. They also see to it that it is sealed properly. 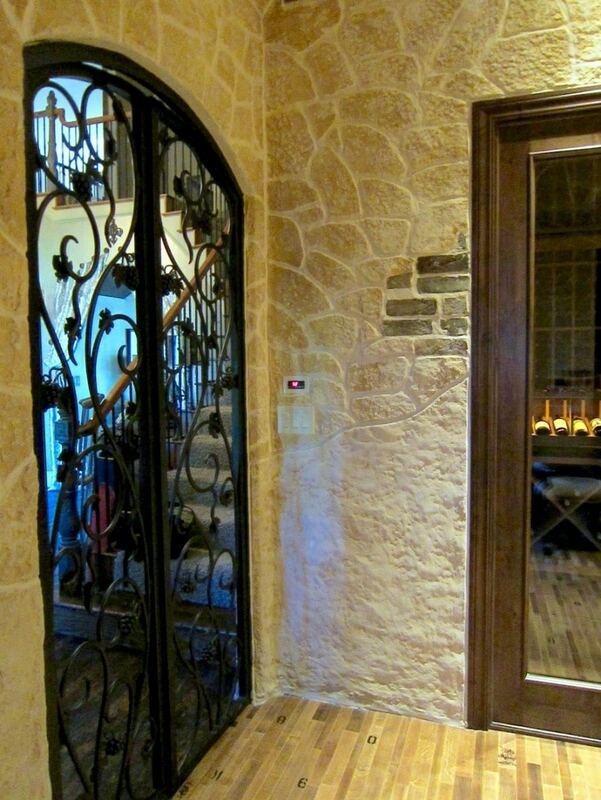 The entrance to the tasting room and bar area is a double gate made from ornate wrought iron with an eyebrow arch. It has a grapevine design and oil rubbed bronze finish. Wine Cellar Specialists supplied the lock and handle set. Stonecoat material was also used on the ceiling and on all the walls around the door. The door to the wine cellar was constructed from Knotty Alder and glass panels. On each side are windows of the same size. It is equipped with proper sealing components such as weather stripping and an automatic door bottom. These sealing components will help regulate the conditions in the wine cellar. If you want to convert a room into a Texas custom wine cellar, contact Wine Cellar Specialists. They can create an impressive design for your wine storage display. Call them today at +1 (866 ) 646-7089 or email them at info@winecellarspec.com.